Congratulations to the new GleanSLO Harvest Leaders! Neighborhood Harvest Leaders participated in a comprehensive training in February. These Leaders are safety certified and ready to go forth and glean their neighborhood’s trees! This entry was posted in Uncategorized on 03/18/2014 by gleanslo. I love gleaning… the concept, the actual work, and the great resulting benefits to the community. I’ve always disliked all the waste that occurs in our society (in the midst of real need), and so the concept of GleanSLO was an automatic winner in my book. Having been involved with the Steering Committee from early on in 2010 (even before it became a Food Bank program), I also got to feel personally how fun and healthy it is to volunteer in the fields and orchards. But as a Food Bank staff person, I am only now finally seeing just what an amazing benefit it is to our community. To see how the fresh local produce goes to kids lunches, or senior meals, or filling up wonderful boxes that are distributed to the needy, I can now see the full circle of GleanSLO. So I pick the apple, box it, and drive the truck to the Food Bank as a volunteer. And then as a staff member I also get to see the kids and adults eating or happily receiving the thing that I just hand picked. I hope everyone that volunteers for GleanSLO can have an opportunity sometime to see a distribution or kids lunch. If so, just let me know and I’ll even arrange it! This entry was posted in GleanSLO Interviews on 03/18/2014 by gleanslo. GleanSLO is holding its second annual city-wide Fruit Drive in San Luis Obispo on Saturday, March 8th. For this one day event, we have an army of volunteers poised to capture all the excess citrus that’s falling from neighborhood trees across the city of San Luis Obispo. With your help spreading the word, the SLO Fruit Drive will raise awareness for the work of GleanSLO and our efforts to harvest produce that would otherwise go to waste and donate to our neighbors in need. 1. Drop off picked fruit at our donation site March 8th from 9am-1pm at Unitarian Universalist Fellowship parking lot: 2201 Lawton Ave. SLO, across from Meadow Park. 2. Arrange for GleanSLO volunteers to pick up or harvest your excess fruit at your home by registering your home on GleanSLO’s website. For more information, contact Jeanine Lacore at jlacore@slofoodbank.org or (805) 235-1180. This entry was posted in Events, Produce Collection, Uncategorized on 03/06/2014 by gleanslo. 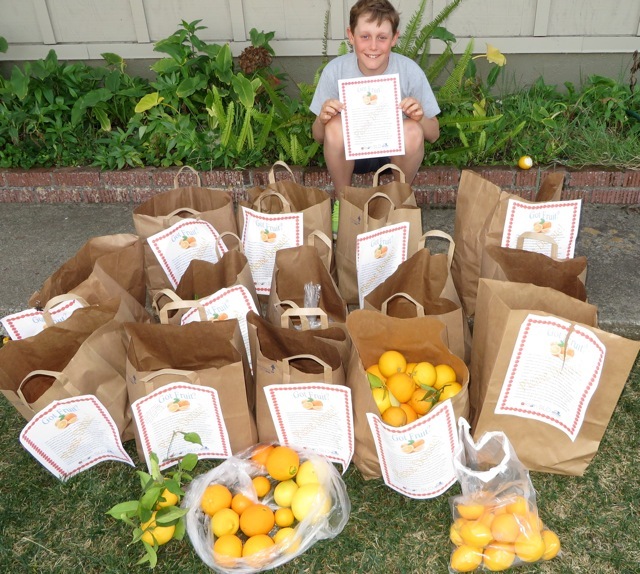 Evan collected 124 pounds of citrus and some apples. One person wanted a sign for their yard: “My Garden Feeds Hungry Families.” He collected $70 for GleanSLO/FoodBank. Evan’s collected fruit was distributed to the Salvation Army where it was gratefully enjoyed by local neighbors in need. 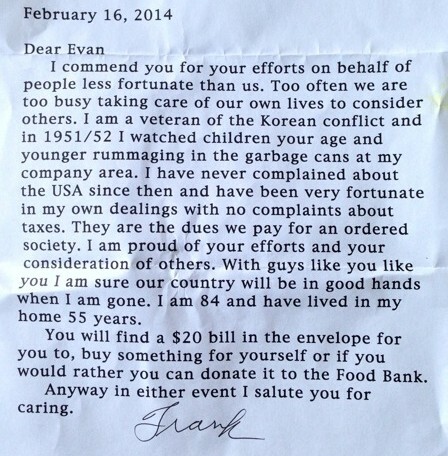 A letter from Evan’s neighbor. Feeling grateful to be a part of this community – for the volunteers, youth and seniors that are committed to giving back and strengthening the bonds that keep us strong as a community. And feeling grateful for the gift of food that keeps bringing us together and feeding our hungry neighbors! This entry was posted in Backyard Harvests, Events, GleanSLO Interviews on 03/04/2014 by gleanslo.